So football, for those on the west side of the Atlantic, is an 11 against 11 game, without body armour, or time-outs, over 90 minutes. However, it does compare with theatre in terms of some of the dramatic, almost oscar winning performances of the occasional player when physical contact occurs. Last week we witnessed a moment of comic tragedy, when Manchester United played Real Madrid in the second leg of their last 16 Champions League tie at the Theatre of Dreams (Old Trafford, Manchester). For 55 minutes Sir Alex Ferguson, United’s manager, seemed to have got his tactics spot on. With a slender advantage, having held Real to a 1-1 draw in Spain, they needed to win or draw 0-0 to go through. In fact by that stage they were 1-0 up and in defending well kept Real Madrid at bay. 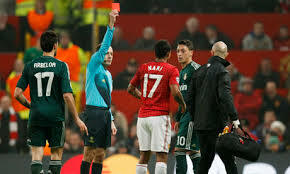 The match was transformed by the decision of the referee to send off Nani, following his attempt to control the ball in the air led to contact with Real player Arbeloa. Nani was watching the ball and couldn’t have been aware of the presence of Arbeloa until the last minute. However, contact seemed minimal, if high, though from his reaction you’d have thought Arbeloa had been shot! Cue the referee showing the red card. A change of tactics from Real Madrid and a clearly rattled United side saw the game changed over a ten minute period when Real took advantage, scoring twice to go through. However, what has received little coverage was the way United responded in adversity. Some time ago we talked about not giving up (Never Know When You’re Beaten, 13 December) and United responded superbly over the last twenty minutes. Their goal had been crystalised into needing to score twice to go through. Despite the numerical disadvantage of being a man sort they rallied and only a series of fine saves from Real’s stand in goalkeeper, Diego Lopez, kept them in the tie. There are a couple of lessons here. Clear goals focus energy and this is not only true at the individual level but is essential for a team. Don’t always judge on outcomes, the right performance may not always produce the outcome you expect but you should always be looking to improve on the performance.